A tapestry of Van Gogh's Iris painting. Van Gogh is considered by many as one fo the greatest painters and artists of all time, for his unique impact on our emotions with his art. This Dutch post-Impressionist created many works around flowers, and this piece Vase of Irises is one of these. The way Van Gogh approaches each element is unique, from the textured quality of the petals to the overall simple yet evocative composition to the rendering of terracotta to give it life and movement can be seen in this work here. Van Gogh loved the theme of irises and has the focus of several of his works on their own as a part of a garden setting. 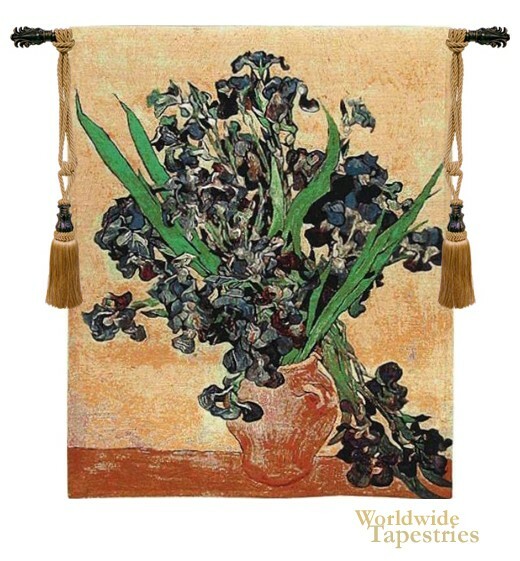 Van Gogh Iris Gold tapestry is backed with a lining and has a tunnel for easy hanging. Note: tapestry rod and tassels, where pictured, are not included in the price. Dimensions: W 36" x H 45"